From Tuesday, 24 December to Monday, 6 January, 2014. 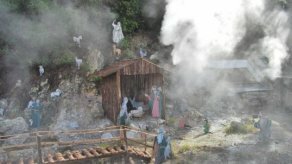 Enjoy this Christmas and come see the Christmas crib in Furnas, during this Christmas season, the nativity the Boilers of Furnas account, again, with plenty of lighting and about 500 figures second relates to a press release. The lighting will be always open between 18 pm and 1 am. 24 to December 26 and day 30 to January 2 the crib will illuminate continuously.